These words are part of a Proclamation done at the City of Washington, the Third day of October, in the year of our Lord one thousand eight hundred and sixty-three, and of the Independence of the United States the Eighty-eighth by the President: Abraham Lincoln. President Lincoln was not the first president to proclaim Thanksgiving, and he wasn’t the last. Today, although the pace of our daily business has changed with the ease of technology, it is important that the foundation of thanks be reminded and put into practice universally, for it is a basic part of humanity. 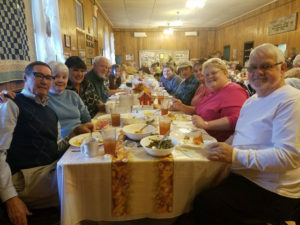 For 126 years, almost as long ago as President Lincoln’s Proclamation, members of St. John’s Lutheran Church in Creagerstown have provided a community Thanksgiving meal on Thanksgiving Day in their parish hall. This year, the room was full consistently, as family-after-family gathered to share the homemade meal throughout the day. 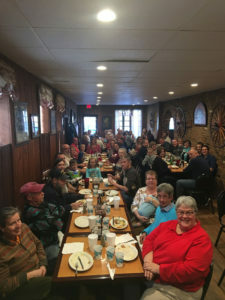 At the Ott House Pub in Emmitsburg, the Ott family, extended family, friends, and sometimes people right off the street, gather to enjoy a pot-luck Thanksgiving feast. This year, one hundred and four gathered for this tradition at the family’s restaurant. Their tradition started when Bernard Ott, a painter by trade, and his wife, Evelyn, opened the Ott House in 1970 as a hobby and “something for their son, Pat, to get into,” said Chris (Ott) Wilson. They had nine children, Buddy (deceased), Pat (deceased), Dave, Susie, Chris, Cathy, Bobby, Rosie, and Ritchie. Today, four are still heavily involved in the day-to-day operation of the business. At the time, the family had grown too large for any one’s house to host Thanksgiving dinner, so the restaurant was the perfect alternative. This year, as always, after our Thanksgiving feasts were consumed and our family members filtered home, the chaos of Black Friday arrived. The season of thanks continues and becomes the season of giving as the holiday shopping frenzy builds. Many families see the end of Thanksgiving as the beginning of Christmas, pushing moms and dads to flock to the stores in search of the perfect holiday gift for their children. The transition from November to December brings lights, candy canes, and plenty of holiday cheer, but what is it that spurs shoppers nationwide to begin checking off those holiday lists one by one? The holiday deals cannot be denied, with stores around the world slashing prices to entice customers to spend their hard-earned cash in their stores. Parents often begin gathering ideas for gifts as early as summer, officially beginning the countdown until the holidays. The holiday crunch is finally here. There are a few different types of holiday givers, with each finding different ways to make their shopping and gifting all come together for their families. The extremely prepared are the early birds who have their holiday gifts purchased and wrapped months in advance, hiding them in a locked-away safe place, away from the eyes of the kids. Then, there are the extremely unprepared procrastinators, who are scrambling to grab the latest and greatest gifts fifteen minutes before the doors close for Christmas Eve. But, the majority of givers fall somewhere in the middle, picking a weekend here and there to peck away at their shopping lists, grabbing the final items just in time for family get-togethers. Though disguised in the materialistic shopping game, the togetherness and camaraderie of being surrounded by the people you care about most is what excites people about this time of year. Events like “Christmas in Thurmont” and “An Evening of Christmas Spirit” in Emmitsburg give people a reason to cook, celebrate, give thanks, and give to others. But…don’t forget to take a moment, take a breath, reflect upon history, remember loved ones who have passed, celebrate the moment, plan the best future, notice the little things, invite the big things, live life fully, and appreciate family and community. Be thankful. Be giving. John and Fay Holdner, Angel and Mike Clabaugh, Randy Welty, Mary Elle Goff, Jaylyn Shaw, Jess Shaw, Bill Thurman, Alice Thurman, Larry Gladhill, and Brooke Gladhill sit together to enjoy the community Thanksgiving Day meal at St. John’s Lutheran Church in Creagerstown. 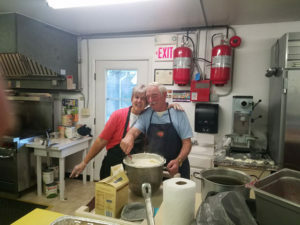 Linda Seiss is shown with fellow volunteer, Russell Long, in the kitchen at St. John’s Lutheran Church. Family, extended family, and community members gather at the Ott House Pub and Restaurant for a Thanksgiving feast. A tradition since 1970.